My family lived in a big city, so spending time on Grampa Jim’s farm during the summer was fun. His house did not have running water, so we didn’t take baths often. When we did take a bath, Mom had my older brother fill the big round washtub with water. The tub was set-up on bricks to lift it off the ground. Mom made sure the tub was right outside the back porch door. Brother pumped a bucket of water out of the well and carried it to the washtub. He filled the tub, one bucket at a time. Next, Gramps lit a fire under it to get the water hot. Then the baths began. One by one, we had a turn in the tub. The last one had to bathe in the soapiest, dirtiest, coolest water. Because Gramps lived alone, he never had a problem with a water shortage. When the family came for the summer, we often ran the shallow well dry. It was only twenty feet deep and thirty-six inches in diameter. The soil on the farm was sand, and to keep the well hole from collapsing, Dad lined it with huge round tiles. Stacked one above the other they formed a huge tube that stuck out of the ground. Grampa Jim and Dad completed the well by building a wooden frame over the tiles. Dad planked the frame to protect the well from critters. One hot July day the well ran dry. Gramps decided that it was time to clean it out. He claimed that sediment built up on the bottom was impeding the flow of water. On a good day, ten feet of water-filled the casing. When the well slowed, the level dropped to two feet. Sometimes we pumped, and pumped, but nothing came up. We had to give the well a day of rest. The water came from a water table near the bottom. As the heat of the summer dried the ground, the water level dropped and kept from filling the well. Grampa Jim got everything ready for cleaning on the following day: a ladder, bricks, a bucket, rope, and a scoop. His plan was to use the ladder to get to the bottom. Once down, he would impede the flow of water by laying bricks on the bottom. Finally, he would dig out the muck. For that, he used the scoop and bucket. We were to hoist out buckets of muck. As small as he was, Gramps had trouble bending down to place the bricks. He managed to get the few bricks in place, and asked that we lower some more. We were lowering the load when the rope broke. The bucket of bricks hit Gramps right square on the top of his head. I thought for sure we killed him. My heart jumped into my throat! We heard a thud followed by the most guttural groan. There was a long silence followed by a litany of unknown Hungarian words. What a relief it was to hear those words. Gramps stayed in the well for a long time waiting for the stars to stop. Finally, after what seemed like an hour, he slowly came up the ladder. He had a deep gash in his head on top of an enormous goose egg. Mom helped stop the bleeding, and cleaned the cut. She chinked a piece of ice from the icebox to keep the swelling down. After a while, Gramps came back out, and fixed the old rope. This time, however, he doubled and tripled the rope back on itself to make it stronger. 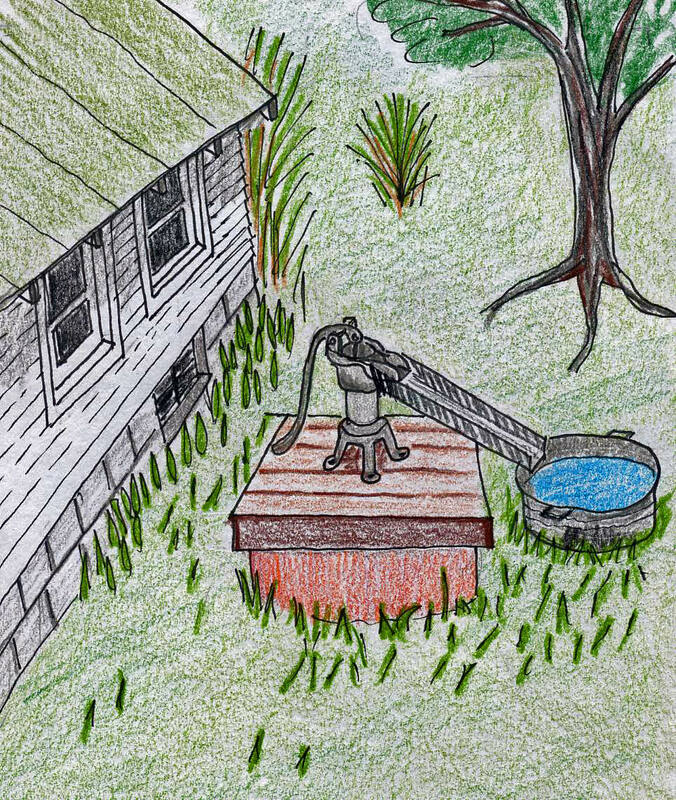 Eventually, the well got cleaned. I don’t think cleaning the well-got us more water, but it did make the water cleaner. Gramps held a glass full up to the sky. If the water sparkled like crystal, he declared it was clean. If he saw black particles swirling around, it was dirty. Regardless, we used it.